Dilemma: You want to add some fun zip to the walls of your home, but you can't seem to find the perfect wall decals/wallpaper to match your colors, style, or budget. Solution: Great News! You can do it yourself! 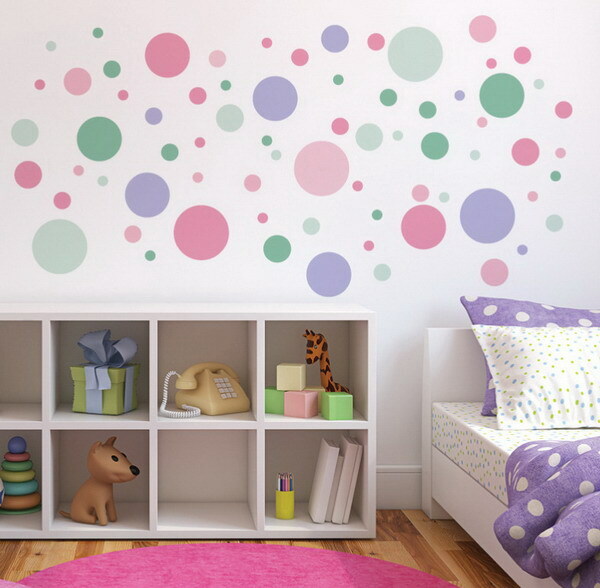 Here is a fun easy way to customize your walls with polka dots of any size. All you need to do is purchase some paint and do a little drawing and you're ready to start. Keep the kids busy by letting them get involved and you'd be surprised to see how good of a job they can do! Which room do you want to decorate? 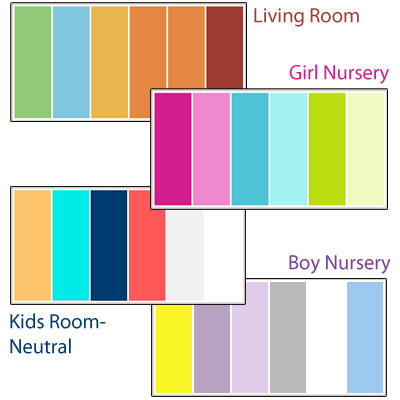 Check out the area and choose colors that would go well with the area. You can go with one color all across or you can alternate between a slew of colors. 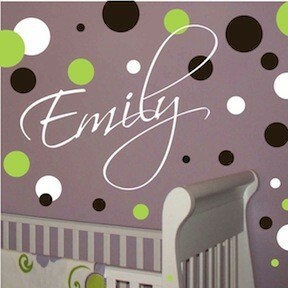 Pastels work great for a little girl's room or baby nursery. 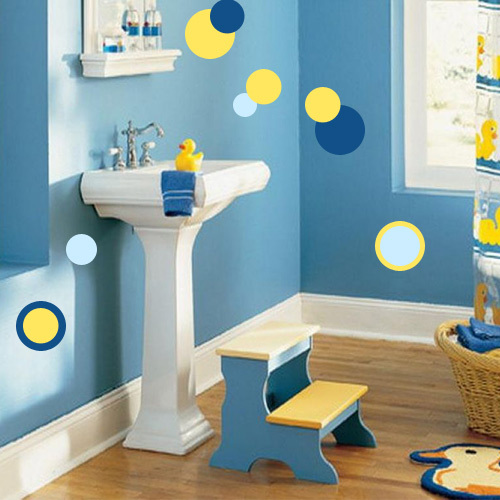 For a playful boy's room, navy/red or aqua/orange combos work great! 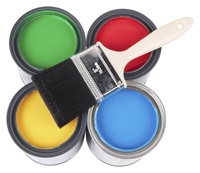 Now you are ready to purchase your paints! Most latex and acrylic paints work great. 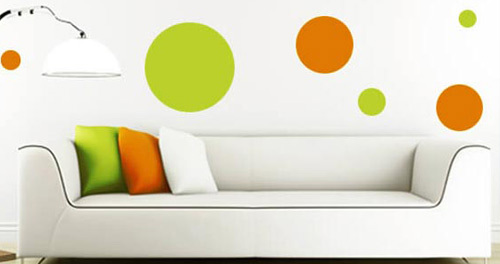 Once you have the paint, you will need to decide what size circles you want and draw them out. Prepare some sheets of card stock paper. There are a few ways you can draw your circles. You can either use a pencil compass/circle cutter (from your local office supplies store) or you can trace any round objects such as can covers etc. Draw or trace your circles onto paper. For a variety of spot sizes, draw some bigger and some smaller circles. When you are done with your drawing, cut the circles out of the rest of the paper and you've got some stencils! (You can use the cut out circle to trace new circles.) Now you have a sheet of paper with one hole or a few holes in it. *It is not necessary to cut more than one circle for each size. They are completely reusable. 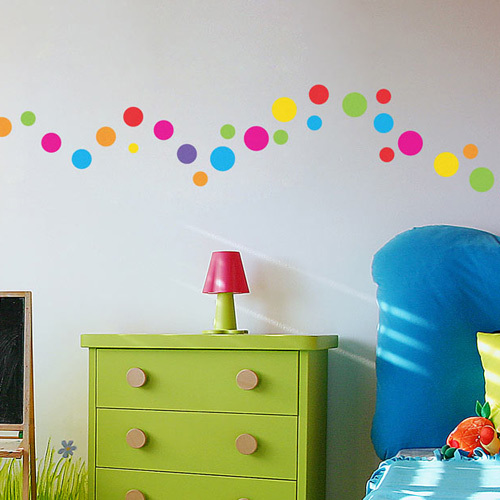 Plan the layout of the dots on the wall and you're all ready to begin! Tape your stencil/s securely onto the wall to make sure it stays in one place. Paint a smooth thin layer over the hole/s. Paint a second coat if necessary. You can now move the stencil to the next spot and switch to a different color paint. Alternate between circle sizes and colors for a more interesting look. Continue with your spots until you are satisfied with the complete look. Leave it and let it dry for 24 hours. 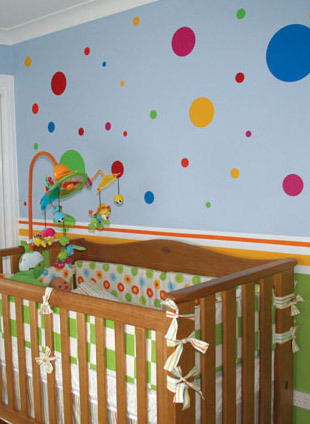 Snap a photo of your completed DIY polka dot walls and SUBMIT. Please include whoever helped with the decor in the photo. Submissions will be entered to win a free wall decal! New winner will be chosen at the end of each month! Start decorating now! *Contest winner will be drawn every month. Winner can choose a free wall decal under $30.